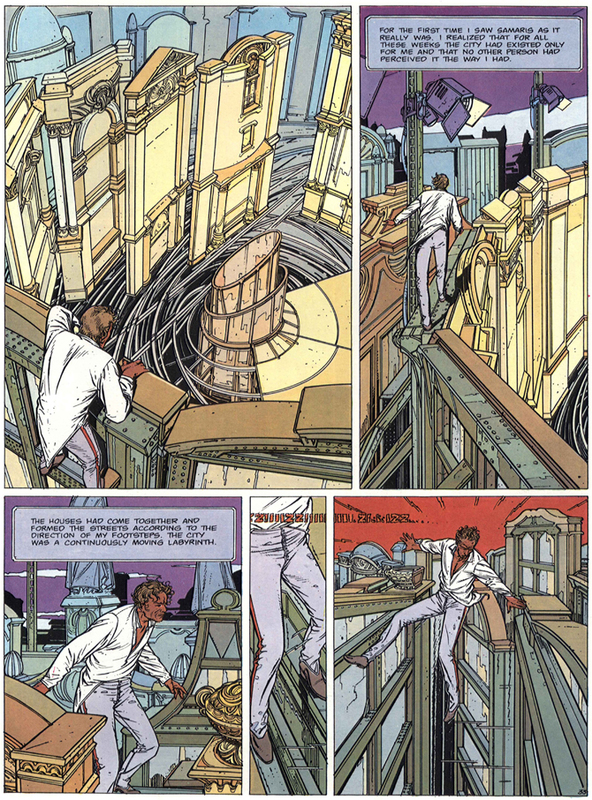 The strip cartoonist François Schuiten and scenarist Benoît Peeters are noted for their series Cities of the Fantastic, the first album of which was published in 1983. The built environment plays a major role in each of the albums, but it is predominantly their first four—The Great Walls of Samaris (1983), Fever in Urbicand (1985), The Tower (1987) and Brüsel (1992)—that contain reflections on the effect of architecture. MVDH: François Schuiten lives and works in Brussels, in a splendid townhouse in the district of Schaerbeek. Despite his full agenda, he has kindly accepted to receive me for an interview; he takes several hours to tell me extensively about his work. He welcomes me in his atelier, which is situated in the attic, a spacious room with large skylights, original drawings by famous cartoonists, several drawing tables and hundreds of art books. The categories in his library give an impression of the large diversity of his interests: utopias, horses, scenography, travel drawings, world fairs, nature, architecture drawings, architecture, Machine Age, sculpture and gardens, decorative arts (wallpaper, design), Art Nouveau, hotels and decoration, countries, Brussels, photography, drawing, graphics, painting… As I shortly introduce my research to him, which concerns comics drawn or commissioned by architects, either as design presentations or as a form of architecture critique, he initially reacts rather warily. He is not happy about a comic strip occasionally being used as applied art, “manipulated” even, and therefore underestimated in its complexity. 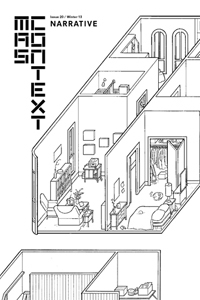 FS: Sometimes it happens that an architect friend or a painter friend shows me a comic he has made. They have thought, “Why not, let’s just try it, perhaps it will allow me to reach a larger audience, get some visibility and explain a couple of thoughts that I wouldn’t have been able to express in another form.” But they often severely underestimate the difficulty of such an assignment and I usually don’t find the result particularly convincing. Naturally, I’m happy for them that they tried it and enjoyed it, but they would need to spend much more time practicing. It’s like when people want to use comics for teaching because they don’t manage with other means. For instance, they say: “French history is boring—so I’m going to use comics”. Or when people are using comics while they actually dream of making films. But the comic strip is not a “sub-film.” That does not do proper justice to the comic strip. It is a mature art form that is not lacking a component. It has its own rhythm and script, it enables people to laugh and cry, and needs no sound, motion and sometimes even no color. Also, a great deal takes place between the pictures. I call that ’the after-action of the eye,’ the notion that an image lodges deep in the eye and leaves a tiny vulnerable trace that is woken up by a later visual emotion. The most wonderful thing that can happen to me is when a reader tells me about a picture that has moved him and then it turns out that it cannot be found anywhere in my book, because he has thought it up himself. MVDH: Schuiten stands and starts showing me around his atelier. He is surrounded by original works of art by famous peers that he considers indispensable sources of inspiration. MVDH: We start talking about Cities of the Fantastic and the impressive success the series has scored, not least among architects. Yet it seems that Schuiten is a bit tired of the label “architecture” that people, for years, have stuck on Peeters and him on account of their earlier work. FS: People imply that we are not making real comic strips. Even if I made a story that is set in the desert or in a wood, they would still say that it is architecture. But sometimes our stories are not about architecture at all; they are about space, about the tension between a space and the characters, about the dramaturgy that makes a space work. Sometimes the architecture is central in that context, but we also set great store by the clothing, the shoes, the jewellery and the hairstyle of the characters, as well as plants and animals. 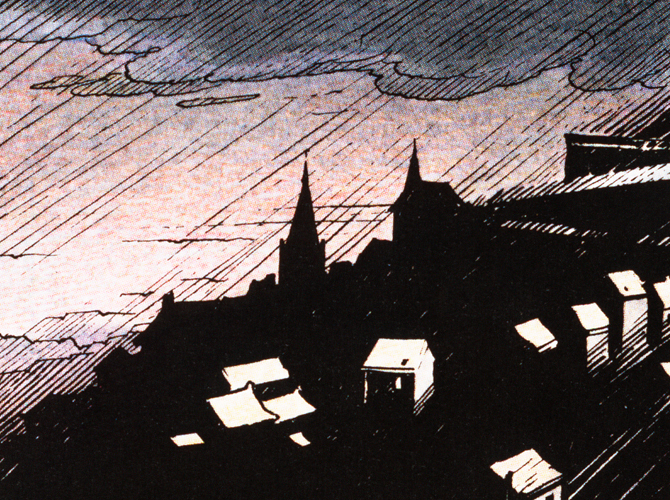 MVDH: People often mistake Schuiten of being an architect himself, which he isn’t. It’s true, he comes from an architects’ family—his father was an architect, his brother, sister, brother-in-law are all architects—but he isn’t. His work distinguishes itself from that of architects both in its narrative and in its graphic aspects. FS: I feel a close affinity with architects. We have the same roots; we have an identical awareness of space. Architecture feels a bit like family, but a family that I have, to some extent, rejected. I go about with them, I understand them, I love them, but actually I’m not really able to place them. I don’t have the same preoccupations. To me, what matters above all is to tell a story. I am much more interested in your emotions than in your living situation and habits. I need to know why you are crying, what makes you laugh and what your dreams are. It’s true, basically one can project his or her dreams on comic strips and architectural designs alike, but the problem is that present-day architects hardly tell stories anymore. They are primarily interested in the tension of a space, whereas I am interested in the meaning that is given to the space, what story it can tell us. MVDH: Yet the stories of Schuiten and Peeters are not solely based on high-quality scenarios and dialogues. Like architects, the authors are also greatly occupied with composition, framework, and focus. It is of great importance to them to realize a credible environment. Drawings should be correct, even if they represent something fictitious. Schuiten wants to be able to draw the floor plan of every building and know how it was built. When he draws a façade, he has to know what is behind it; otherwise it is credible neither to himself nor to the reader. Whether it concerns buildings, people, shoes or train engines, he always uses models to depict them as true-to-life as possible. But most of all, it is the human dimension that matters to him. FS: My drawings are always three-dimensional, whereas architects usually draw plans and sections. I find plans more difficult and a bit boring. I prefer to draw buildings in perspective, as architects used to do in former times. Present-day architects use computers and more sophisticated conceptual tools. I regret that they have neglected the art of perspective, and the frequent absence of personages is also a great loss. When you draw people, you are introducing the human dimension in a natural way with your hand as well as your brain: a person, an extra dimension, a vulnerability or strength. This is how an entirely different concept of space is created. The art of drawing is very tangible and physical; mental concepts, dreams, utopias are internalized and given concrete shapes by means of pencil and paper. That is another aspect that makes them so indispensable in architecture: architects should occasionally indulge in some fundamental research in a utopian and experimental space. Some people manage to make great architecture without drawing, but I believe I can sense the difference between those who draw and those who don’t. Drawing adds an extra dimension. When we were at the Expo in Hannover, it was really amazing. Everyone from Jean Nouvel to Toyo Ito was presenting his work. There were piles of free cards with all kinds of images. We were the only ones with “real” drawings; all the others had computer-generated imagery, and none of the other cards were going away as quick as ours. Obviously people were seeking for emotions, which the renderings couldn’t give them. MVDH: The differences that Schuiten depicts have not always existed. In his opinion, they increased in the digital era but emerged during Modernism, when the accent was increasingly put on function and functionality. In former times, it was unthinkable for architects to draw buildings without a human figure inside to give an idea of scale. And above all, architects had the capability to enable people to dream. Schuiten is enamoured of earlier architectural drawings. He still has vivid memories of the large, black-and-white wash drawings created by his father, which, although their purpose was to impress clients, always had an overwhelming thundery sky. Not only did the drawings from bygone days look different from those of today, they also gave more information: architects were art directors. As a small boy, Schuiten sometimes accompanied his father on a visit to a client. FS: There, my father produced his pastel crayons and began to talk to the client. The client would pour some whisky, drink one himself, and then my father began to draw the house and—very smart—he introduced the dressing table of the lady of the house, the favorite chair of the man of the house, the dog, and drew it all probably four times as large as it would ever turn out to be. Then he sprayed fixative over the pastels, pulled out a passe-partout, framed the drawing and set it on the dresser of the lady. “So,” he would say, “just think it over.” Sometime later, the phone would ring. “Yes, Mr. Schuiten, we agree to your proposals.” What did that mean? He drew their dreams; he opened a window on what could be their future. 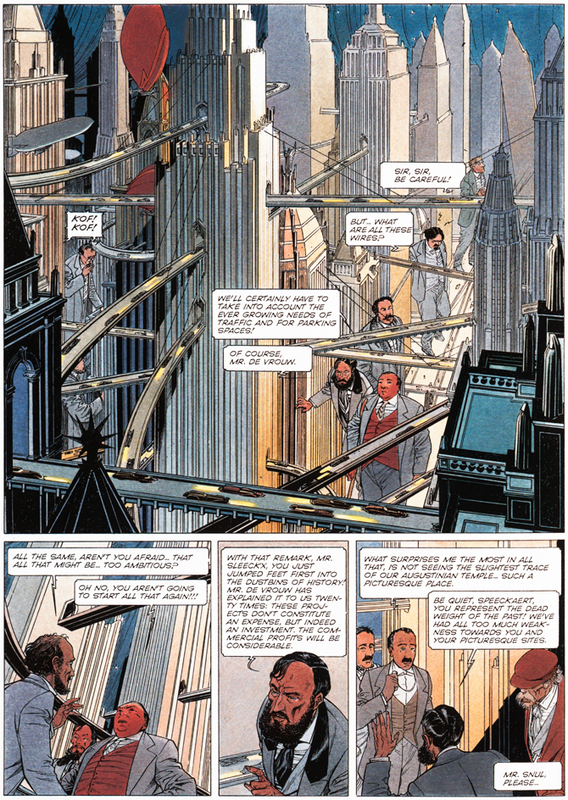 MVDH: Architects are not the only ones who think they can simply make use of a comic strip, but to Schuiten, it is more incomprehensible to use it in architecture rather than elsewhere, because architects themselves can draw without having to tap into products from a different discipline. Why do architects want to make use of strips at all, he seems to suggest, when they can simply generate architectonic drawings? FS: When I see drawings by Archigram, I think, “these authors don’t need the comic strip, they have such a lively imagination!” Why should they make an excursion outside their own discipline? Their work has undisputable narrative qualities, it stimulates the imagination, the images are “splattering.” Certain architects are extraordinary artists. So why don’t they just draw like architects? I believe I would enjoy that much more than when they do so in the guise of a comic style. Actually, they are playing around with form; it’s a kind of game that resembles acting or karaoke. They could just as well make a video game. Perhaps I like architecture too much to watch impassively how it amuses itself and makes itself ridiculous. MVDH: A major difference with architects is that they use the art of drawing to design buildings, whereas Schuiten uses it to fathom the architectural styles of others and to penetrate to the essence of the underlying ideas: the thought processes of its designer and all the layers of significance that a building has attained in the course of time. FS: It is a wonderful experience to penetrate into the depth and bifurcations of a person’s thoughts, and memorable to find them well wrought and powerful. With [Victor] Horta and [Henry] Van de Velde, it’s such a great pleasure! It’s coherent, the light is amazing, there is so much behind it! But when I don’t sufficiently understand something, I cannot draw it. For instance, how am I supposed to draw glass architecture?! At best I can draw my own mirror image, but that is not particularly exciting. MVDH: Thus the art of drawing has a critical potential. There are designs that Schuiten ruthlessly dismisses because he cannot get a grip on their raison d’être via his pencil. In the Brüsel album (1992), Schuiten and Peeters take a critical look at the urban planning foundations of Brussels, their place of residence. Brüsel is a blueprint of Brussels and the characters have been borrowed from real-life figures, but the authors take the detour of a fictive storyline to give critical commentary on the policies of local authorities and urban planners. For Schuiten, working on the Brüsel album was an occasion to discover the local Court of Law. FS: The more I applied my drawing pencil to explore its details, the more value it acquired. I became fascinated by its spatial organization, equilibrium and logic, and the stage-management of a wealth of details. The building is an inexhaustible source of stories. Its architect was completely mad and his pyramid, which towers high above the city, embodies justice on the one hand but simultaneously bears witness to a country that, leaning upon its colony, the Belgian Congo, imagined itself to be a world power. Yet although it is an outrageous building and it is always cold at some spots, even so-called “sensible people” regularly confide to me that they are proud of it and they would not relinquish it at any price. 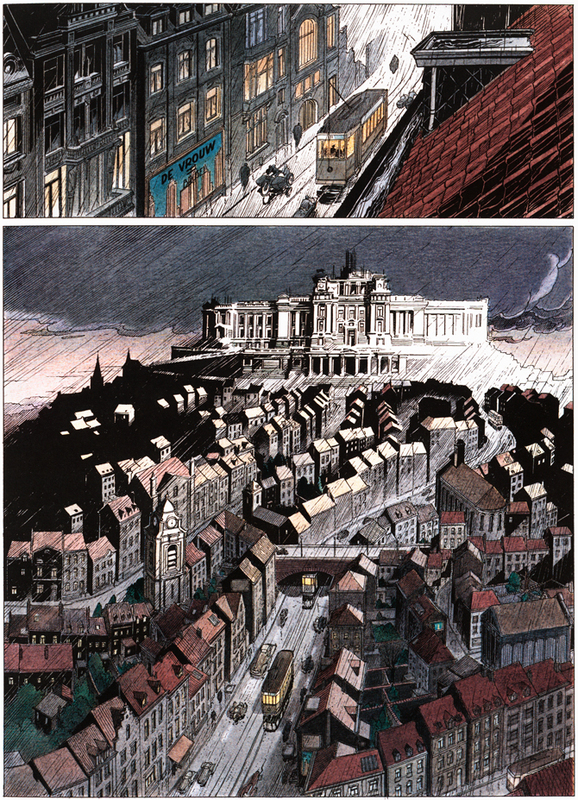 MVDH: In their album, Schuiten and Peeters obviously assume a position in urban planning debates. They are primarily disappointed that the property market’s urge for wealth is the dominant force in Brussels, due to a lack of coherent urban planning policy and vision of the future. Although almost all the issues that are covered in Brüsel are now history, the book was a thorn in the flesh of the local authorities. In a frantic attempt to repair the so-called “damage” to the image of the city, the Minister-president of the Brussels Capital-Region even commissioned another strip cartoonist to create a kind of “anti-Brüsel,” presenting the history of the city purged of all controversial episodes. This reaction was incomprehensible to Schuiten. MVDH: And how did urban planners react to your book? FS: We observe each other; we sniff at each other like old dogs because we fight for the same things, but not in the same way. In a certain way, they are like ayatollahs: they have to defend integrity and coherence. Sometimes they make mistakes, but by and large they do really good work. Their aspirations are very legitimate; it’s just that they are sometimes a little dogmatic. I approach similar matters in a fictional way. But if you want to draw something properly, you need to know it. And when you start to know it, you start to appreciate it. And when you start to appreciate it, you don’t want it to be endangered. So at the end of the day I’ll end up like Greenpeace, chaining myself to the Court of Law. 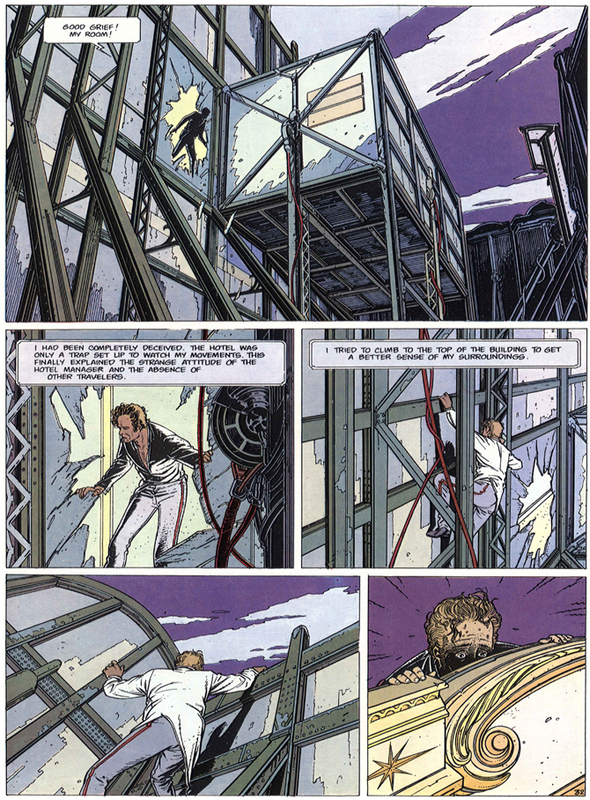 François Schuiten was not yet 20 years old when he published, in 1973, his first comic strip panels in Pilote. In 1968, he met his future partner in crime, Benoît Peeters. In 1982, they ultimately created their first joint project. The readers of (A SUIVRE) magazine are introduced to Les murailles de Samaris. Ever since, the two men have remained inseparable. They designed books of all shapes and sizes within the framework of the Cités Obscures. Since the mid-80s, he has collaborated with various filmmakers, for whom he dreams up décors and costumes. He is also an illustrious scenographer, be it for the public sphere (Porte de Hal metro station in Brussels and the Arts & Métiers metro station in Paris) or for exhibitions (Le pavillon des utopies in Hanover in 2000). He was awarded the Grand Prix de la Ville d’Angoulême in 2002. Mélanie van der Hoorn is a Cultural Anthropologist with a specialization in Material Culture. She is the author of Indispensable Eyesores: An Anthropology of Undesired Buildings (Berghahn Books, 2009) and Bricks & Balloons: Architecture in Comic-Strip Form (010 Publishers, 2012). Currently she is working as an independent researcher (research project on creative architectural commercials) and as an external lecturer at Vienna University of Technology and the University of Innsbruck.